Gears of War: Ultimate Edition Standard Version - Xbox One Just $10 Down From $40! You are here: Home / Great Deals / Amazon Deals / Gears of War: Ultimate Edition Standard Version – Xbox One [Digital Code] Just $10 Down From $40! 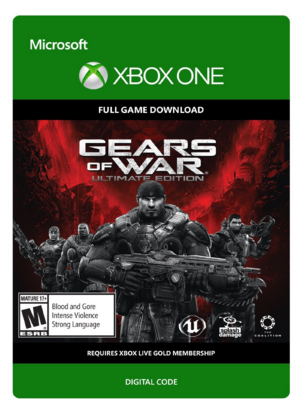 Gears of War: Ultimate Edition Standard Version – Xbox One [Digital Code] Just $10 Down From $40! Head over to Amazon and score this deal on Gears of War: Ultimate Edition Standard Version – Xbox One [Digital Code] for just $10 down from $40! Get yours now while it lasts! Original Gears of War is remastered in 1080P and modernized for Xbox One including support for 7.1 Surround Sound. The Digital Standard Edition includes a Civilian Anya skin and Imulsion Lancer skins playable in multiplayer.